I was recently asked what I thought was the quintessential fall fruit. My mind instantly turned to apples. Perhaps it was the abundant sea of warm reds and lime greens that welcome me every time I enter the supermarket this time of the year. Or perhaps it was the weather. That morning, when I woke up and looked at my clock, it was 8am. I turned to ask Akber to check his watch and I heard a muffled '8am.' But how could it be? There were no rays of bright morning light sneaking past my shutters. Maryam, my dependable alarm clock, had failed me that morning as well. She was fast asleep. 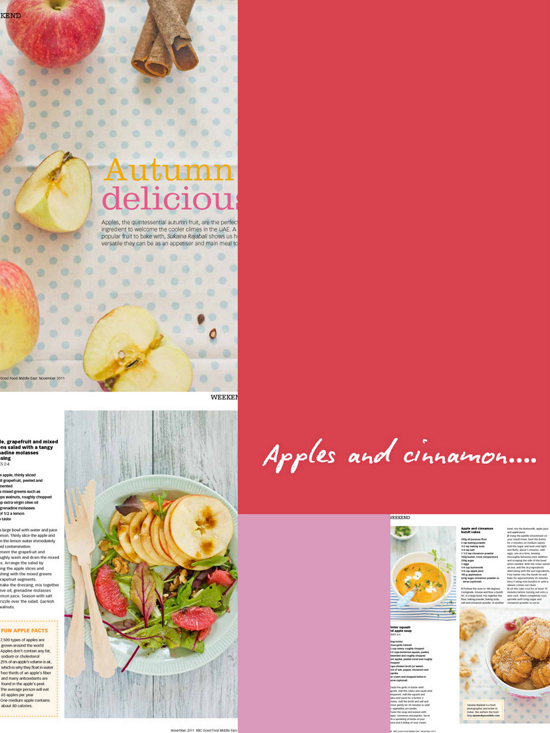 And so to welcome the cooler climes in Dubai, I developed these three fall recipes for BBC Good Food Middle East using apples. 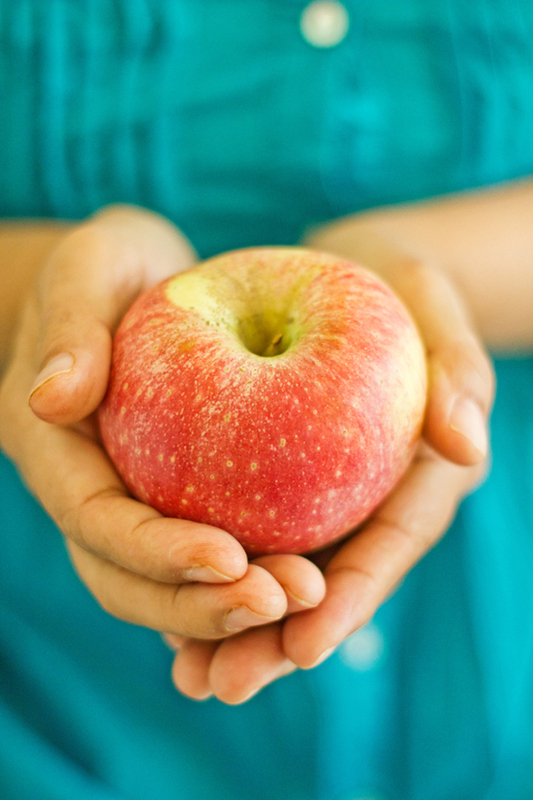 Although I instantly think of desserts baking when I imagine apples, I enjoyed experimenting with it versatility by using it in a salad and soup as well. 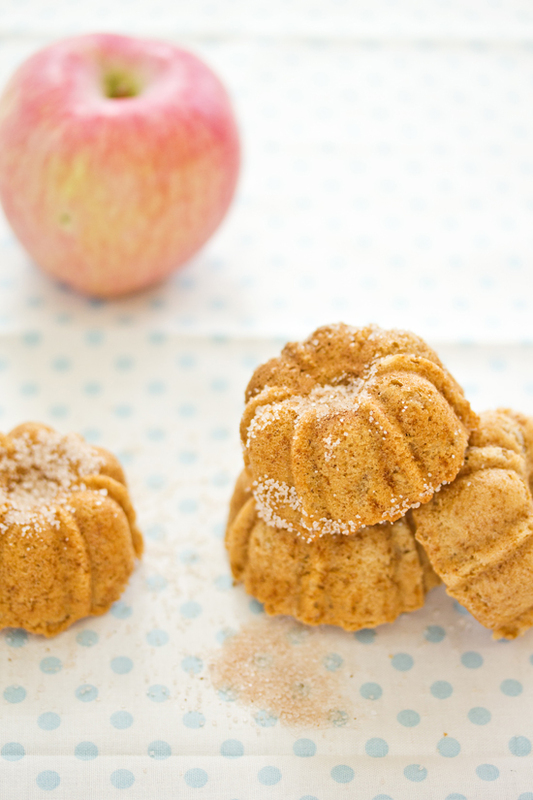 From the three recipes, this one for apple cinnamon bundt cakes is my favorite, the one that excited me the most. 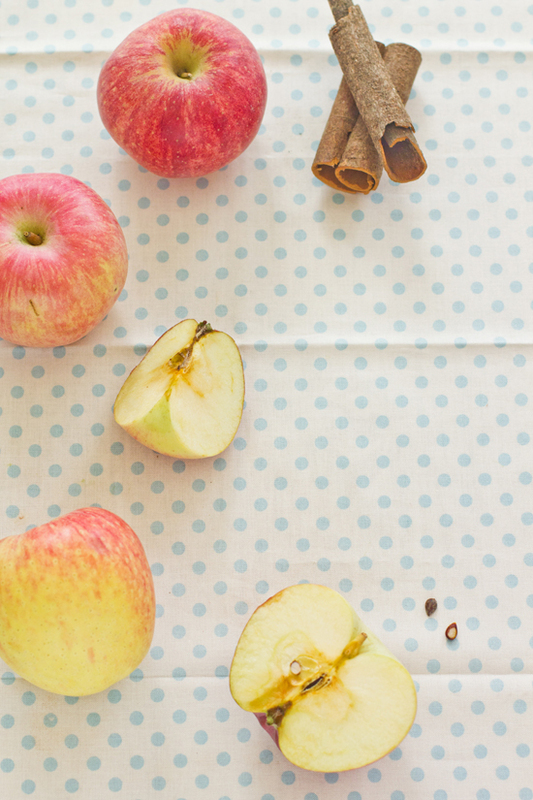 It's as though cinnamon was created to be used with apples. Almost like you can't have one without the other. A lasting reunion. I used some homemade applesauce that Maryam normally eats with her banana and porridge for breakfast. I wished I had added some whole chunks of apple in the batter. Next time. There surely will be a next time. Perhaps I'll rock that happy marriage of apple and cinnamon by replacing it with some cardamom? In other news, I have made some minor changes to the way I have laid out blog posts. You might see some pops of colors here and there. 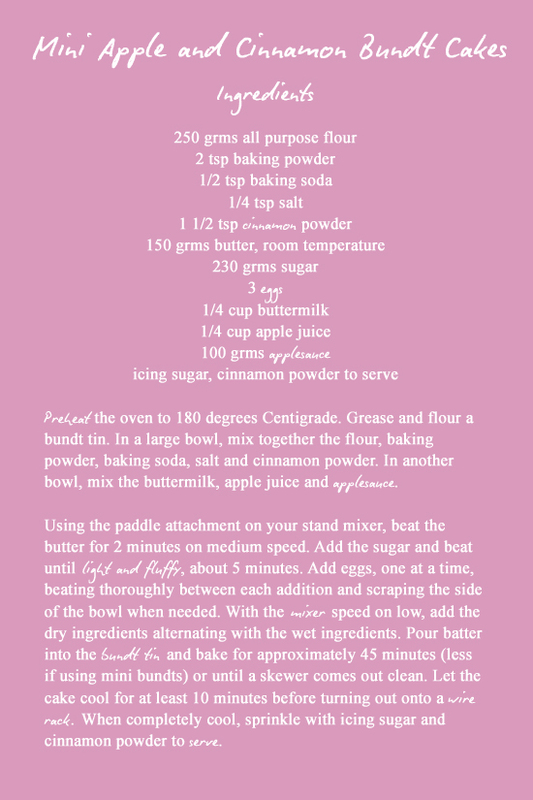 The recipes can also be printed out by clicking on the recipe card at the bottom. Color is such an important part of food, of photography and of nurturing creativity and that's what I am hoping to do. I was inspired by this post Rosie wrote on art, color and inspiration which introduced me to the beautiful concept of Design Seeds. It is as though color is for the eyes what music is for the ears. You can get lost in both these sites and happily spend hours looking at various color palettes that you may never have imagined. Do you like the new changes here on Sips and Spoonfuls? I would love to hear your opinion. Click on the recipe card to print. 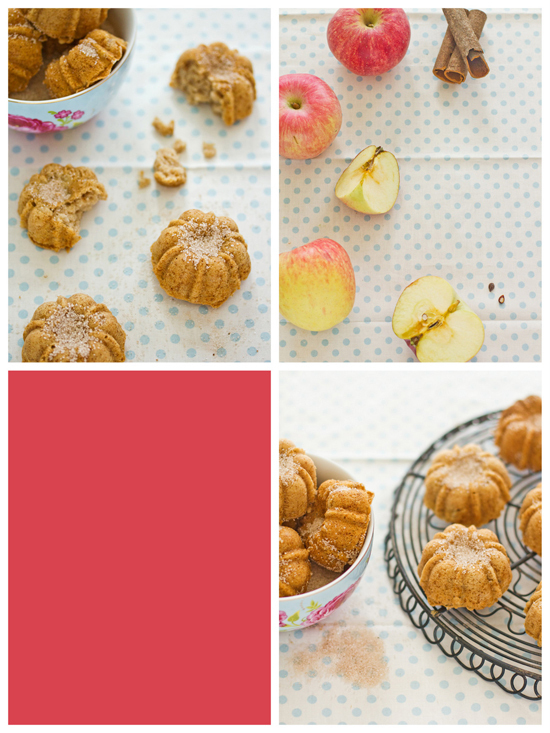 Lovely clicks and Bundt cakes! Congrats on being published in an issue of BBC Good Food. Marvelous creations. Wat a super delicious cute looking mini bundt cakes. A dash of color adds variety,Sukaina.I too went through the Design Seed's color palette and adore it.How did you get the recipe card done? Been wanting to do that in my posts but couldn't find any plug-ins for blogger. 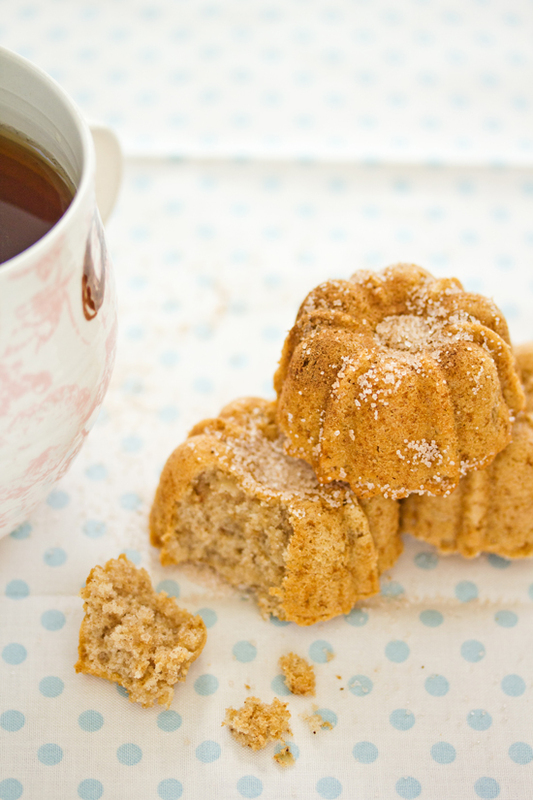 Wow..fabulous bundt cakes with tempting clicks..
Awww, these are the cutest little dessert, ever! 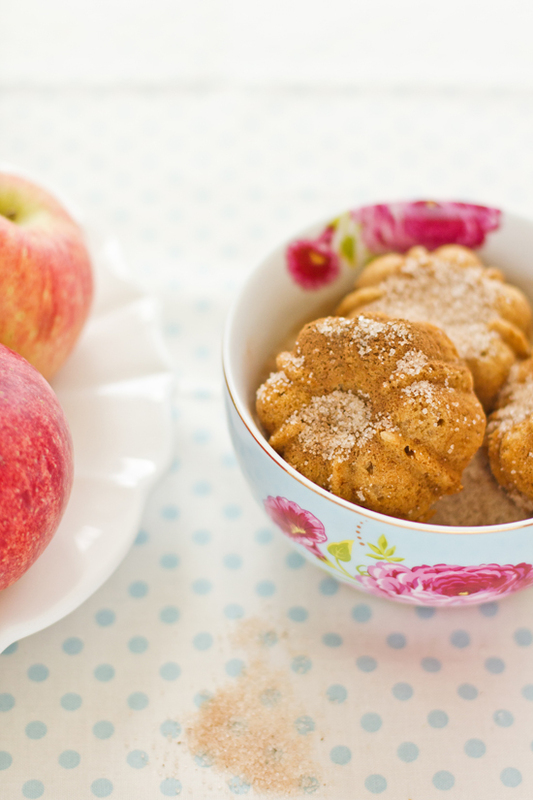 :) And nothing beats apple with cinnamon. I LURRVVVEEE Design Seeds... I had their first book which someone pinched off me :( I think the recipe card printable rocks! I love all of it! The spread, the blog... the cakes! The cakes look fabulous! And congrats on the feature! Blog looks so much better with the splash of color..not that it was not beautiful before but now it is total visual treat ! How odd I have been thinking about adding a recipe card to my blog as well, just haven't figured out how yet. Thanks for paving the way. The actual card is something I created on PS Elements and then linked back the recipe image (the actual card) to the recipe I created on Google documents. I hope that helps. If you have any more questions, let me know. Hey S! Congratulations on being published in BBC Good Food! The mini bundts look so decadent. Congrats on being published. 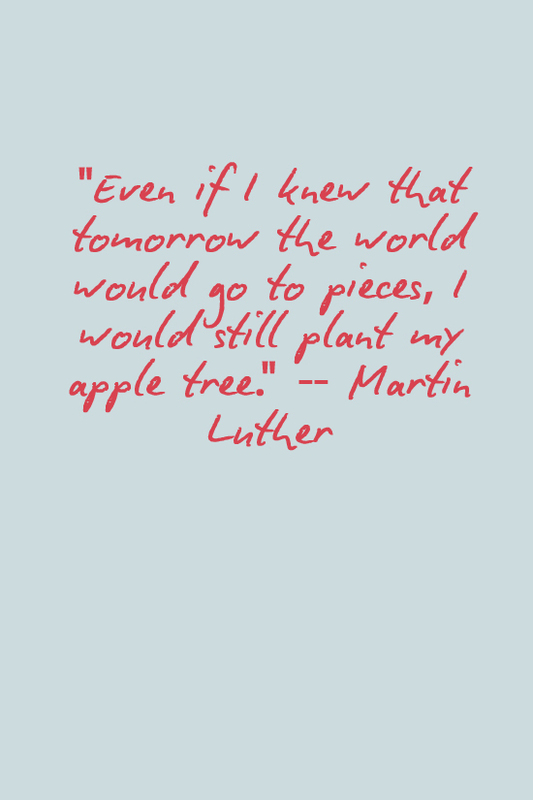 Apples and fall are synonymous in my head too. Beautiful pictures. BBC Good Foo Middle East is new to me. I have got to check it out. The recipe card look gorgeous! Love it. Everything is new looks great! I also love the cake, I'll definitely bake it! Beautiful! Beautiful! And congrats on the feature. Love the new changes! 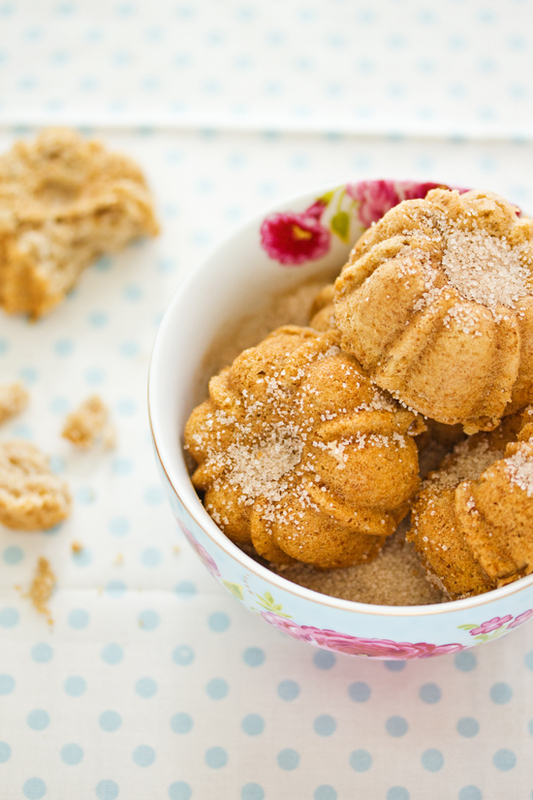 I have a mini bundt pan just like this one - would love to try these cakes! And I agree - Rosie's suggestions about color are fantastic, and the hues you are working with here are so soothing but alive at the same time. beautiful. This would be a recipe I would love to try with my girls. 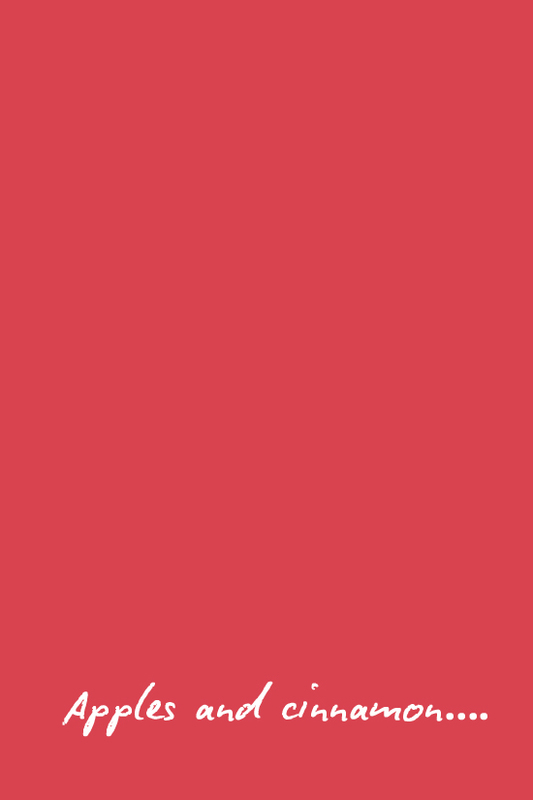 Love that red/pink you have thrown in, a great contrasting colour to your blues and the apple reds. Congratulations for your contribution to this magazine !! your photos are gorgeous ! I think the color additions and recipe card idea are fantastic. Your photos are always stunning and now they are complemented beautifully by additional block colors. Thanks for the great recipes and calming descriptions, and congrats on being published in BBC! Love the pops of color and the beautiful mini bundt cakes! Congratulations on your BBC Good Food feature. It's beautiful!!!! As are those mini bundt cakes!!! I want a mini bundt pan for Christmas now!! Congrats on your BBC Good Food feature! Love your post Sukaina..congrats on being featured in BBC good food. Your recipe card is superb and thanks for sharing about how you made them, I have also made card similar way..all thanks to you. I love these, they're so gorgeous and little. I've never made bundt cakes before and I really want to get a pan so I can make small ones like yours. Love the sprinkling of sugar on the top too, it makes them look like doughnuts! Do not package your linens and clothing in garbage purses because they can quickly be ripped. So, always buy a thicker and a bulkier bag that will not burst during the move. Make sure to adhere to these essential suggestions to settle in your new position without any pressure. These will make sure you land at your new position safely with all your essential valuables. Moving with the children is a challenging process for almost every mother or father, especially if the child is having an “off” day. التي تقوم بنتائج جيده حيث تعتمد الشركة على افضل عماله من جميع انحاء دول العالم لاننا متميزين عن غيرنا ومتخصصون فى غسيل الخزانات من الداخل بمهاره وكفاءة عاليه وبأسعار رمزيه . فان شركتنا لنقل الاثاث بالرياض يتوفربها كل ما تبحث عنه وبشكل حصري من خدمات فك وتركيب وتعبئه , علما باننا نعتمد على فريق عمل قوى يقوم بكل هذه الخدمات بخبره عاليه , فضلا عن ان شركتنا بالرياض لديها افضل معدات النقل الحديثه بكل الاحجام المختلفه والتى تناسب لنقل كافة محتويات العفش والموبيليا وبأسعار متواضعه جدا وبأفضل العروض والخصومات المذهله , فاذا اصبحت واحدا من عملاؤنا الكرام فستنعم بالعديد من المزايا التى لن تنعم بها فى ربوع اى شركة اخري..